This review has been requested by The Client. The scope of this review and the rating is limited to the general investment capabilities of Halcyon Asset management, LLC (the “Firm” or “Halcyon”) within the strategies listed in the second table below, as well as the anticipated merits of its new European product. It does not extend to an operational due diligence of the Firm. Halcyon is an investment management firm based in New York. The Firm manages approximately $11 billion across various strategies and products including event-driven multi-strategy, structured credit, liquid loans, collateralized debt obligations, and energy. It is now in the process of launching a new product – Halcyon European Credit Opportunities Fund (the “Fund”), which will invest in distressed and special situations opportunities in Western Europe. This Fund is expected to launch on May 1, 2015 with approximately $100 million. The Client has negotiated a Master Custodial Account (MCA) agreement with Halcyon that allows The Client to invest up to $125 million in various Halcyon products. The Client may also invest in direct co-investment opportunities that may be offered by Halcyon. The MCA excludes investments in Halcyon’s structured credit (ABS) product. As laid out in its investment plan, policy and guidelines, the MCA enables The Client to initially invest $50 million in the newly launched Halcyon European Credit Opportunities Fund. This investment will be limited to 50% of the total account on a fully built-out basis. In addition, the MCA limits investments to a maximum of 25% to any individual fund and to a maximum of 10% to any individual direct investment opportunity. Exceptions to these limits may be allowed pursuant to a written permission from The Client. A Consultant research recognizes that the MCA mandate is intended to be flexible and opportunistic. It will allow The Client to invest tactically across a range of Halcyon funds and direct co-investments. While A Consultant cannot vet each future allocation that may be made under this mandate, it anticipates that The Client’s staff will review each investment, independently on its own merit, as well as in the context of the The Client’s portfolio at the time of making such investment. 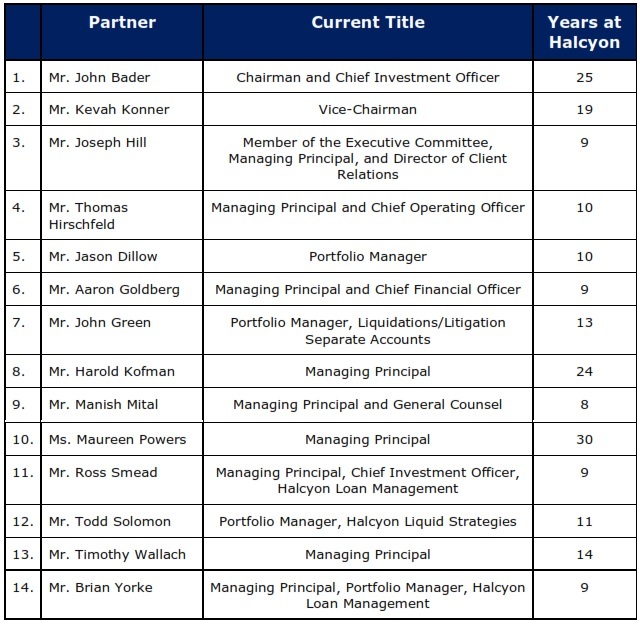 • Experience: The senior investment members at Halcyon have an aggregate of +60 years of investment experience. The team has invested together over multiple market cycles, thereby providing significant continuity in their investment process. In addition, the industry networks developed over two decades has allowed the Firm to build strong sourcing capabilities, both in the primary as well as in the secondary market. • Ability to attract talent: Halcyon is able to attract investment talent due to its strong financial situation as well as deep industry contacts. Mr. Damien Miller, who joined Halcyon in 2014, has +12 years of investment experience in distressed debt and special situations in European markets. He was previously the Global Head of Special Situations at Alcentra Ltd and was responsible for investment and portfolio management of the Alcentra Special Situations Fund. This product invested in European distressed debt, high yield, and equity special situations strategies. • Key man risk: Mr. Miller will be primarily responsible for all day-to-day investment decisions for the Halcyon European Credit Opportunity Fund. However, the Fund’s legal documents do not identify Mr. Miller as a ‘Key Person’. In addition, Mr. Miller is not an equity partner at the Firm and a retention agreement has not been executed as of this date. The Fund’s liquidity terms include an initial one year hard lock, which may prove to be onerous if Mr. Miller were to depart Halcyon for any reason during that period. ▪ Certain clients of A Consultant have negotiated a side-letter to include Mr. Miller in the Key Man clause. • Lack of dedicated analysts for European coverage: The research team dedicated to the Fund consists of three portfolio managers – Mr. Miller (UK), Mr. Greene (NYC/PM-Multi-strategy fund), and Mr. Dillow (NYC/ PM-Multi-strategy fund). While in general, the research, trading, and risk management functions at Halcyon are centralized and shared, given this Fund’s unique geographic focus, a team of analysts dedicated to it would be ideal. To date, the Firm has not hired any analyst dedicated to this product. ▪ The Firm plans to hire an analyst in Europe to work with Mr. Miller once the Fund is launched. No definite hire has been made as of the date of this report. • New launch: The European Credit Opportunities Fund is expected to be launched on May 1, 2015 with $100 million from four to five investors in the founding share class. The product, therefore, does not have an established track record or deep asset base as of the date of this report. • Track record for Mr. Miller: Due to the contentious circumstances under which Mr. Miller departed Alcentra, he has not been granted the requisite permissions to reference his track record from the Alcentra Special Situations Product (ASSF). Halcyon is therefore unable to (officially) offer any historical performance metrics for Mr. Miller. However, it should be noted that The Client was an investor with Mr. Miller at Alcentra. • Risk management: Mr. John Bader, Chairman and Chief Executive Officer of Halcyon Asset Management, LLC is also the Head of the Risk Committee. An investment professional, who is a key decision maker and stands to benefit directly from a product’s performance, is not considered to be an ideal candidate to head a risk committee. In addition, the risk management function for the European fund is expected to be controlled from New York. The standard preference is to have risk management on-site at the investment decision making process. In 1981, Alan B. Slifka started to manage capital for some US high net worth individuals. 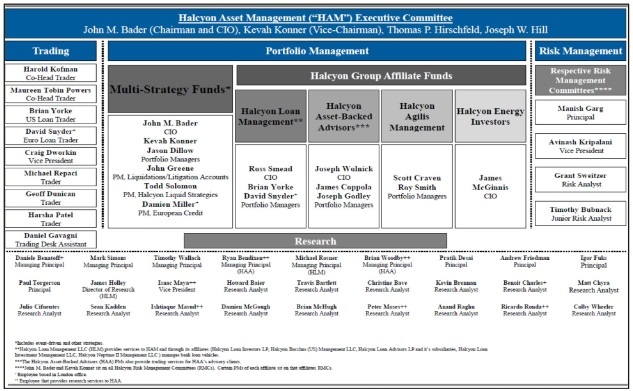 This was the genesis of Halcyon Asset Management LLC (“Halcyon”). Mr. Slifka was a well-known investor and the founding chairman of the Big Apple Circus. He passed away in 2011. From 1981-1991, Mr. Slifka managed assets by mostly investing in merger arbitrage strategies. Later, in 1991, he hired Mr. John Bader (current Chairman and CIO) as a senior portfolio manager to expand the investment mandate to other strategies like corporate distressed debt and special situations. In 1996, Halcyon Offshore Asset Management, LLC was officially launched and the investor base was expanded to non-US and offshore institutional investors. Since then, the Firm has progressively expanded its businesses and global footprint. It currently manages approximately $11 billion in assets across a wide array of products and strategies. The Firm has 14 partners and 125 employees, 50 of whom are investment professionals. Halcyon is headquartered in New York City and has satellite offices in Houston and London. The Firm is registered with the SEC in the US and with the FCA in the UK. Currently, 80% of the Firm is owned primarily by 14 active partners, none of whom own a majority ownership stake. The remaining 20% is owned by Dyal Capital, an affiliate of Neuberger Berman. This is a passive interest which does not carry any voting rights or investment authority. (Research) and Mr. Larry Davidoff (Research). 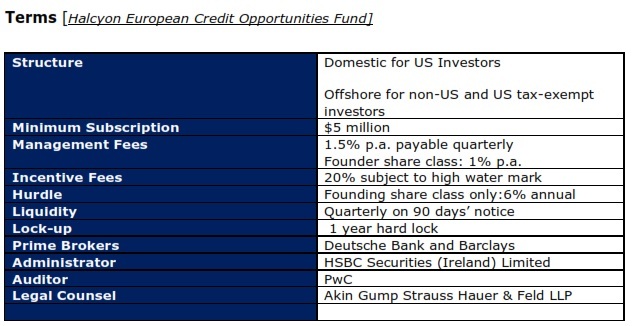 The European Credit Opportunities Fund (the “Fund”) is expected to be managed by three portfolio managers: Mr. Miller, Mr. Dillow, and Mr. Greene. Mr. Milller officially joined Halcyon in December 2014. He previously worked at Alcentra Ltd, where he was responsible for managing the European Special Situations Fund. The Fund expects to hire a dedicated analyst during the year; however, for the time being Mr. Miller is expected to utilize the analyst and trading teams based in New York. The Fund is expected to be registered in the UK and Mr. Miller is anticipated to be responsible for the day-to-day management of the Fund’s portfolio. 2. Event-driven situations like merger arbitrage, spin-offs, litigations, etc. On the credit side, the Fund is expected to invest primarily through senior debt. While the portfolio is expected to be mostly long biased, the Fund will seek to hedge certain types of market risks. Investments are expected to be mostly in small-mid capitalization companies. The Fund will seek to impose a 20% position limit and a 30% industry limit. 1. Idea Generation: The research analysts are responsible for conducting an extensive screening process to identify the right investment opportunity. This includes a comprehensive analysis of the investment universe and monitoring news feeds like newspapers, magazines, court filings, SEC offers, industry publications, etc. The analysts also explore their network of resources like lawyers, bankers, buy and sell side analysts, etc. to access information and conduct reference checks regarding the idea. Each analyst works in conjunction with a senior investment professional or a portfolio manager. In most instances, the portfolio managers are responsible for providing the top-down guidelines and for directing the analyst’s research process. a. Fundamental analysis: Reviewing the fundamentals of the company operating margins, gross/net revenues, trends, debt capacity, current/historical leverage, cash flows, liquidation analysis, etc. The team also analyzes these metrics under various types of stress scenarios. b. Restructuring and Pro-Forma Analysis: This involves a thorough analysis of the potential restructuring options and its impact on improving fundamentals. This review also considers the possibilities of various legal outcomes and the creditors’ rights under those various options. Furthermore, the analysis also considers various implementations and instruments – conversion rights, debt vs. equity, maturity and call features, etc. c. Strategic analysis: Under this review the analysts are responsible for conducting a market analysis of other strategic investors, key players and their motivations, investor/shareholder base, identifying large investors and their alignments, reviewing existing management goals and incentives, board compositions, other bidders –synergies/dilutions/regulatory concerns, etc. d. Cost-benefit analysis: Analysts estimate the feasibility of restructuring options, the associated costs, tax/regulatory impacts, disclosure issues, downside risk, concentration and refinancing risks, potential for frauds, etc. All these costs and risks are put in perspective of the potential for expected minimum/maximum upside under various probability weighted (outcome) scenarios. 3. Investment decision: Each position is thoroughly researched by mini research teams, typically led by one or more senior analysts, and then discussed with the portfolio managers. If the idea is worth an investment, then the portfolio manager discusses it with the investment committee and the trade is implemented based on its merit as well as on the portfolio investment mandate. There are a select number of investment committee members that can authorize a trade. 4. On-going monitoring and Research: Halcyon’s Investment Committee (IC) meets every morning to review big positions within the portfolio. The IC considers the existing positions in light of – current trading levels, any recent developments or news, changing risk-reward dynamics, other compelling ideas, etc. This analysis is dynamically updated by Halcyon’s trading desk. The portfolio managers review this analysis on a regular basis and adjust position sizes based on their assessment of each position’s absolute downside risk and the relative probability and attractiveness of the expected outcome. The research team for the Halcyon European Fund is expected follow a similar research process. Halcyon anticipates adding more analysts to the research team in London during 2015. 4. The Multi-strategy Fund leverage is capped at 300% gross; historically, the long side has maxed at 150% and the short book has varied from 10-100%. The Fund has never been net short. 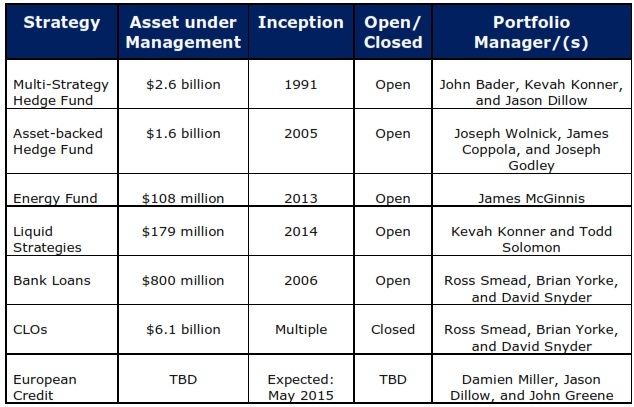 Mr. Miller is expected to be primarily responsible for day-to-day portfolio construction aspects. Mr. Miller is expected to be supported by Mr. Jason Dillow and Mr. John Greene. The Risk Management Committee at Halcyon is composed of Managing Principals responsible for investment management of the funds and managed accounts. John M. Bader, Chief Executive Officer, is Chairman of the Risk Committee. In addition, the risk committee consists of Mr. Manish Garg (Principal), Mr. Avinash Kriplani (Vice-President), Mr. Grant Sweitzer (Analyst), and Mr. Timothy Bubnack (Junior Analyst). risk committee routinely performs stress analyses. In addition to monitoring the individual fund portfolio risk, the risk committee also analyzes the cross-risk across different products and the Firm. individual position risk. However, distressed investments tend to be directional (long) by nature. Mr. Miller joined Halcyon in December 2014. He was previously Managing Director and Global Head of Special Situations at Alcentra where he built the firm’s distressed and opportunistic credit investment business and acted as Portfolio Manager having started there in June 2007. Prior to Alcentra, he was a Director and Portfolio Manager for the Special Situations Group at Barclays Capital in New York starting in 2002. Before this, he was a senior analyst at Barclays Capital in London. Mr. Miller graduated with a B.A. in European Business from Manchester Metropolitan University in 1997. High Yield Research team. Mr. Greene received his B.A. from Franklin & Marshall College in 1999. Mr. Bader has been portfolio manager for Halcyon’s multi-strategy funds since 1991, after serving as Director of Research at Gruss & Co. Mr. Bader has been a frequent speaker at educational and industry forums on investing, including ones sponsored by NMS Management, Institutional Investor, The Borsa Italiana (Italian Stock Exchange), the World Presidents’ Organization, and Skybridge Capital (SALT). He has participated in the Barron’s Roundtable, and has been featured in the Financial Times, Pensions & Investments, and Bloomberg, among other publications. He has appeared on CNBC and Bloomberg TV. Mr. Bader is a member of the Board of Advisors for the Harvard Law School Forum on Corporate Governance and Financial Regulation, has served as a member of the Research Council of The Greenwich Roundtable, and has lectured at Columbia Business School. A recipient of numerous academic prizes, Mr. Bader received his A.B. from Harvard University, Class of 1984.
joining Halcyon from 1992 to 1995, Mr. Konner was Co-head of the proprietary Risk Arbitrage Department for Smith New Court Inc. From 1985 to 1992, Mr. Konner was a senior analyst specializing in event driven situations for two proprietary trading operations: Gruss & Co. (1987 to 1992) and Ladenburg Thalmann & Company (1985 to 1987). Mr. Konner’s professional career started in 1983 at Asiel & Company, where he traded for clients and for the firm’s account in Merger and Convertible Arbitrage and other situations. Mr. Konner received a M.B.A. from the Leonard N. Stern School of Business, New York University in 1989, and a B.S. from the Wharton School of Finance and Commerce, University of Pennsylvania in 1983. • The opinions presented herein represent the good faith views of A Consultant as of the date of this report and are subject to change at any time. • Information on market indices was provided by sources external to A Consultant, and other data used to prepare this report was obtained directly from the investment manager(s). While A Consultant has exercised reasonable professional care in preparing this report, we cannot guarantee the accuracy of all source information contained within. • This report may contain confidential or proprietary information and may not be copied or redistributed.